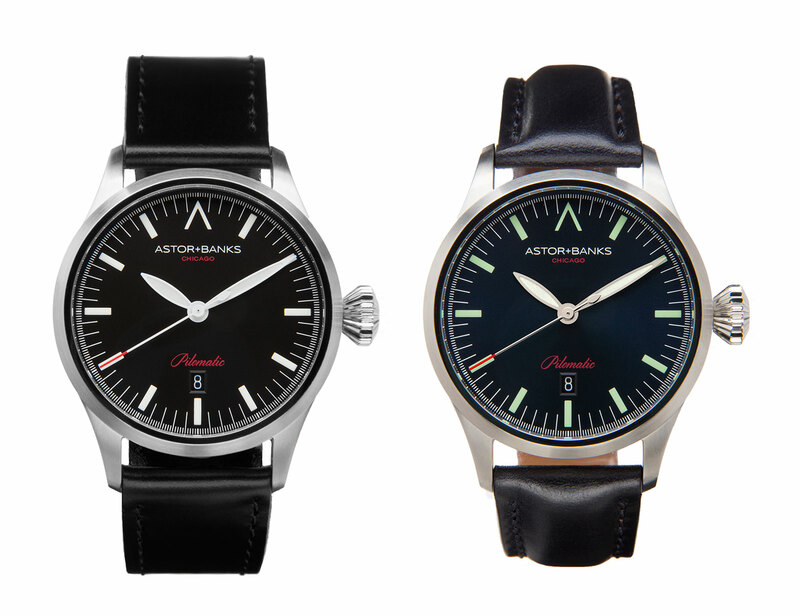 Chicago-based Astor+Banks is a new brand that concentrates on affordable watches with a military-style design. After a quartz chronograph and a time-only, hand-wind, Astor+Banks third wristwatch is the Pilomatic, a watch that takes its cues from several well known aviation timepieces. 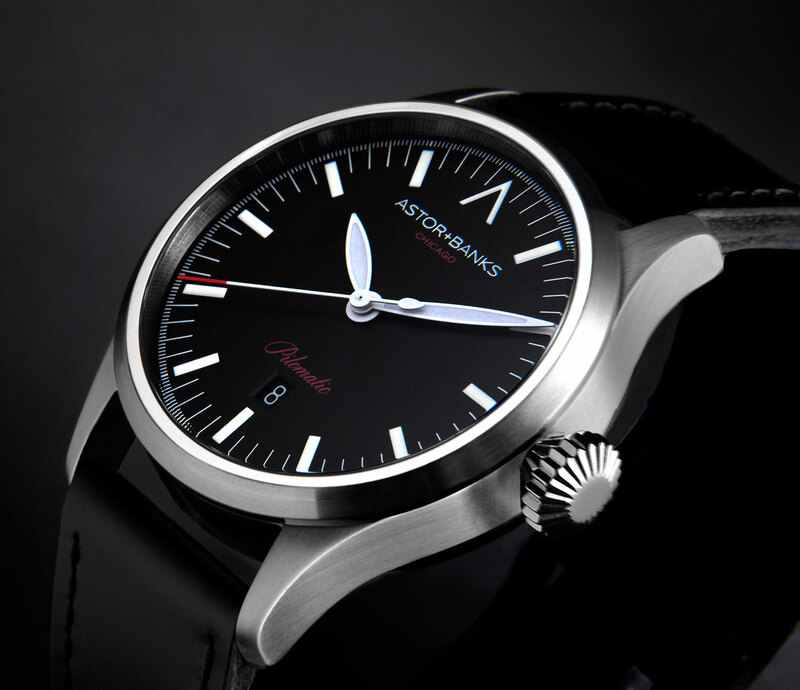 The Pilomatic is stainless steel, 42mm in diameter and fitted with a sapphire crystal. The look is a modern take on the extra-large Second World War German airforce beobachtungsuhr worn by aircraft navigators (which provide the inspiration for today’s IWC Big Pilot’s Watch). So the screw-down crown on the Pilomatic is onion-shaped, just like on the vintage b-uhr, but the 12 o’clock marker is an upward chevron instead of a triangle. And the hour and minute hands are shaped like propellors. 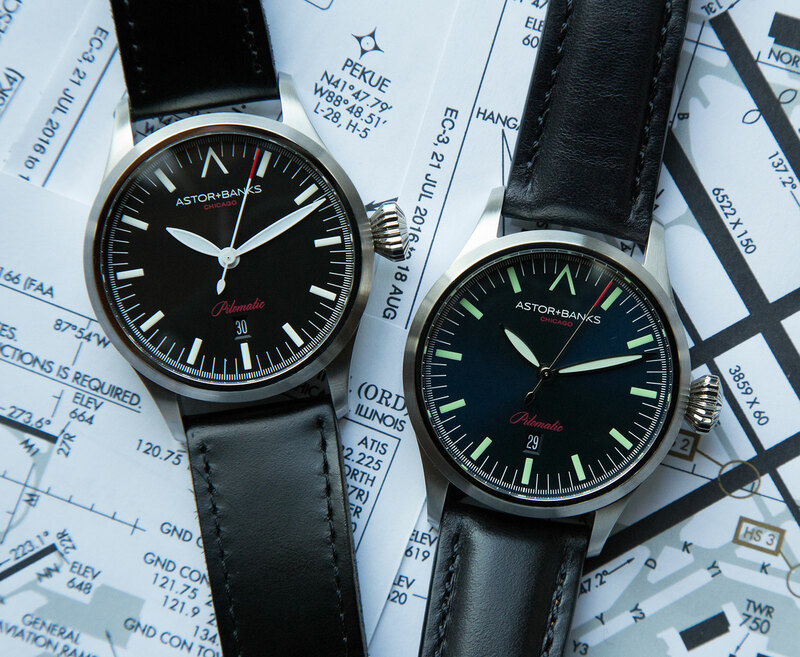 Two versions are available: a black dial with stark white Super-Luminova, or a dark blue dial with sun ray brushed finish and greenish Super-Luminova. The Pilomatic is limited to 100 pieces, divided evenly between the two dial colours. Astor+Banks is named after the two intersecting streets in Chicago where company founder Andrew Perez got his start in 2012. 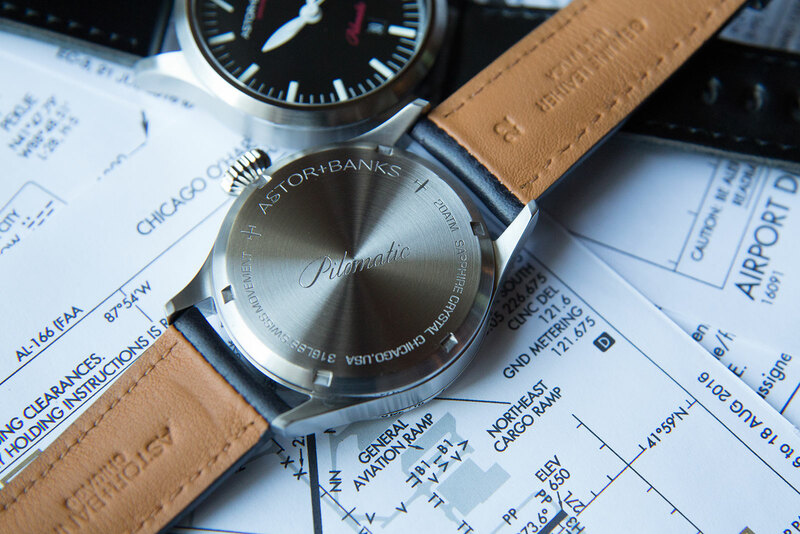 Like many other start-up watchmakers, Astor+Banks relies on suppliers for the components of the Pilomatic, which are then assembled by Perez and his watchmaker in Chicago. The division of labour is a familiar one that balances quality and cost effectively: the movement inside is the Pilomatic is a Swiss made ETA 2824 automatic, while the case and crown come from a German company, and other components are made in China. A global supply chain is inescapable for watches in this affordable price segment. That being said, the eventual goal of Astor+Banks founder Perez is to manufacture the external components of the watch, meaning the case, dial and hands, in the United States. The Pilomatic is priced at US$950 for pre-orders, and will rise to US$1249 subsequently. It’s available direct from Astor+Banks.